Mid Century Mrs: Adventures with the Gas Company. A couple weeks ago, I swear I smelled gas in the font yard. I walked away and came back a couple times to make sure it wasn't something else... That and the fact that we have a giant dead spot of grass in our yard (a sign of a gas leak in the line is dead foliage) made me feel that it was better to be safe than sorry. I called the gas company and they sent someone out right away. They arrived at about 9 o'clock in their normal small utility van/truck. The guy checked the yard quick and then came in to the house. He checked everything gas related; the meter (which was inconveniently located in the basement), all of the lines going to appliances, and all of the gas appliances. No leaks anywhere. While checking the meter, he noticed that the line coming into the house was corroded. Not good. He had to call in someone else to make a decision on that. In the meantime, he said he would go out and do some more checking. This involved pounding a metal pole/stake into the ground to test below ground as well. I'm also fairly certain that he was just sitting out in my grass for awhile, waiting for the other guys to show up. Around 10 o'clock, a HUGE truck showed up complete with a tractor/digging contraptions and signage that would be used to block off a road... And it was not quiet. So, all of these guys go down into the basement and come back up about 5 minutes later to inform me that they would be replacing the line and moving our meter outside (yay to outside meter!). We figured out a day that would work and as we were wrapping it up, I could hear my neighbor outside "What's going on?!?" Presumable talking to another neighbor. So, I walked back out with the gas guys and let her know what was happening. I think she was glad that I wasn't trying to level the neighborhood. Yesterday was the day that the meter was moved and the incoming line replaced. It seemed to all go great. 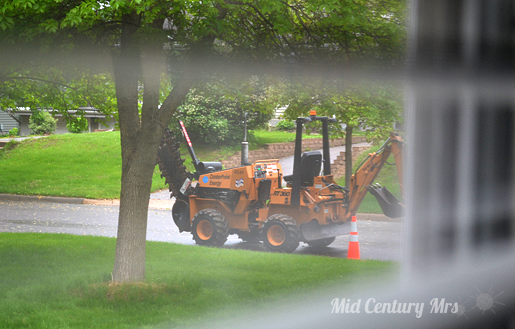 They arrived and came in to double check the meter and location. They had people come and go for the past week or so making the lawn with all of the different underground lines (Call before you dig!). 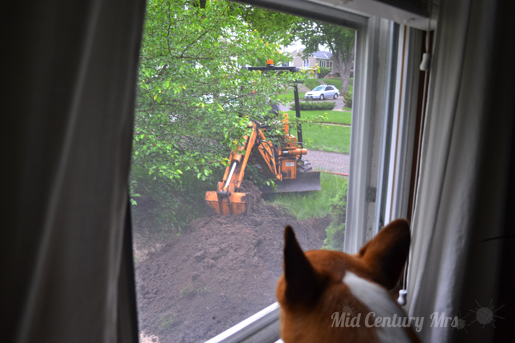 They pulled out their pretty awesome digging machine, dug a big hole and moved/replaced what needed to be switched. The guy that did all of the work inside was awesome. I am very glad I cleaned up the dead bugs and spiders for him! Ick! Super nice, very respectful of our home, and very helpful with some tips on my gas appliances. After everything was done he showed me everything and made sure I didn't have any questions or concerns. I was really hoping that this meter removal would make it so we didn't need a weird closet in the corner of the basement when we finish it, but it looks like we still might have to... I'll have to see what our contractor says when we get to that point, but it's a lot better than it is and my main concern, the old pipe still sticking out of the wall, might fit just fine within a wall still. I guess we'll have to see.